Another sequel phone from Cherry Mobile had been officialy released. 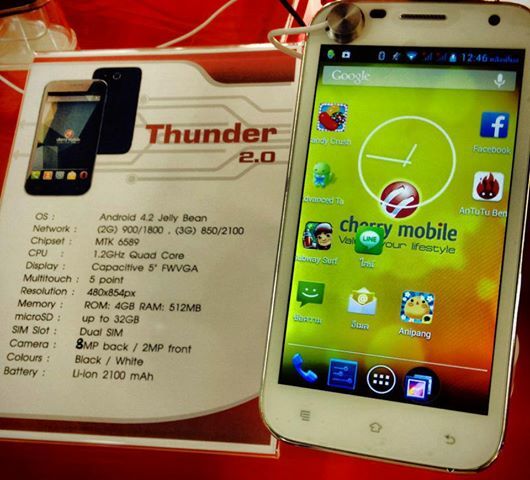 Today the Cherry Mobile Thunder 2.0 flashes its angst against any other quad-core wannabes. So what can we expect with Thunder 2.0? Though it's 5-inch screen real estate disagrees, I just think that it's a mid-range handset having a shy 512MB of RAM and FWVGA (196ppi) screen resolution. It may underwhelm in the display department compared to its Omega cousins but it catches up with the same 1.2GHz quad-core processor for efficiency and speed. And the fact that it is only priced at Php 6,299, it could put a shade to the likes of Titan and Hyper. Running the whole show will be Android 4.2 Jelly Bean. The battery is also a legit 2100 mAh which will put you on the go for an ample amount of time. All in all, I just think that this phone is a steal for those looking for a 5-inch workers in the market.